Let’s face facts! When a prestigious organisation like Pearl Valley chooses your product it’s a good thing – a very good thing! And so, when Club Car – distributed in South Africa by Smith Power Equipment (SPE) – got the order to supply Pearl Valley with 70 spanking new Club Car Precedent i2 golf carts to replace its ageing Club Car fleet, there were celebrations all-round. “We were very excited for this order,” says SPE’s Stephen Mangold. “Pearl Valley is one of the most professionally run golf facilities in the country and for them to choose Club Car is a powerful statement not only of their respect for the product but also of their confidence they have in our ability to give them world-class service and support,” he says. Mangold paid special tribute to Damian Wrigley who played an integral part in the negotiations. Wrigley says it was decided to stay with Club Car for several reasons including: the creative financial package offered by Smith Power and associated financial house; the fact that with the previous fleet SPE easily lived up to their reputation for combining excellent product with backup service to match; and the Visage GPS system. “In the purchase of high-ticket capital equipment in tight markets such as we are currently experiencing, the financial solution is crucial and SPE offered a creative and workable solution, which ultimately made the deal possible,” he says. In terms of Club Car’s Visage GPS system it is not surprising that it was a critical aspect of the deal as not only was the integration of connectivity into golf carts pioneered by Club Car but also because it is so much more than just a simple GPS distance measuring device. “The Visage is a complete management system, which, while elevating the golfer’s experience and enjoyment, through a series of features it helps to improve the golf club’s bottom line,” says Mangold. Management of Assets – the course and fleet are the club’s greatest assets. Visage protects both by reducing golf car abuse, accidents and theft; at the same time it also can be set to protect tees, greens, bunkers and sensitive areas, which helps to significantly reduce expenses. 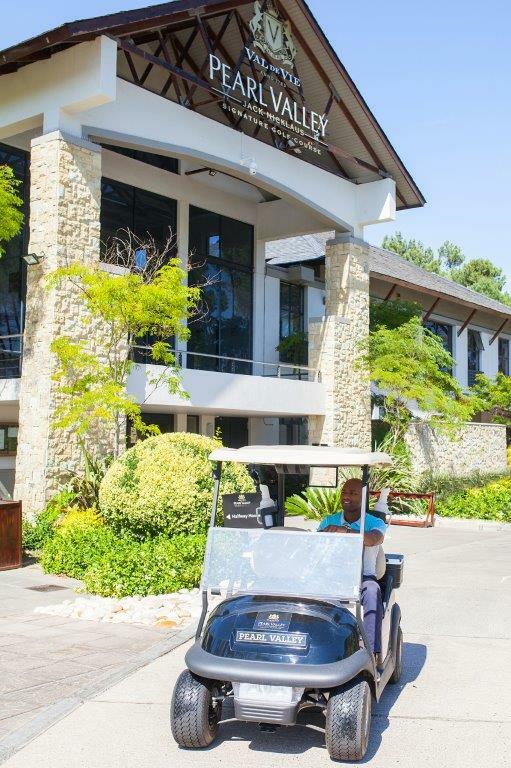 Fleet Management Facility – features which help optimise efficiency of fleet and golfers’ enjoyment include: at-a-glance view for cart’s status while on the course; battery status and software update status; car in-use or on-charge information. Revenue Boosters – displays of sponsorship, advertising, half-way house and golf shop promotions and more help to improve the club’s revenue. GPS Features – these include: 3D visual green layout; distance to the front and back of green; distance to pin and hazards; pro tips; pace of play monitoring and alerts; scorekeeping and real time leaderboard and also a hole fly-over feature which Pearl Valley says they intend to introduce. “Club Car’s research shows that 86% of golfers feel that the Visage system helps to improve their scores,” says Mangold. 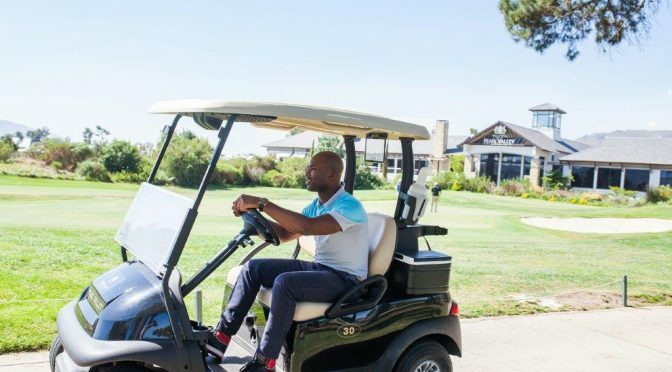 He adds that Club Car and the Visage system’s popularity is growing in leaps and bounds in South Africa with many well-known courses opting for it. Country Club Johannesburg (CCJ) and Copperleaf are two such examples. CCJ golf director, Bevan du Plessis, who, like Pearl Valley’s Wrigley, emphasised that an important factor in choosing Club Car was the Visage system, which, he says, is “better suited to most GPS systems at golfing facilities”. An additional benefit for Pearl Valley was that home-owners on the estate were able to buy the older carts at very good prices. 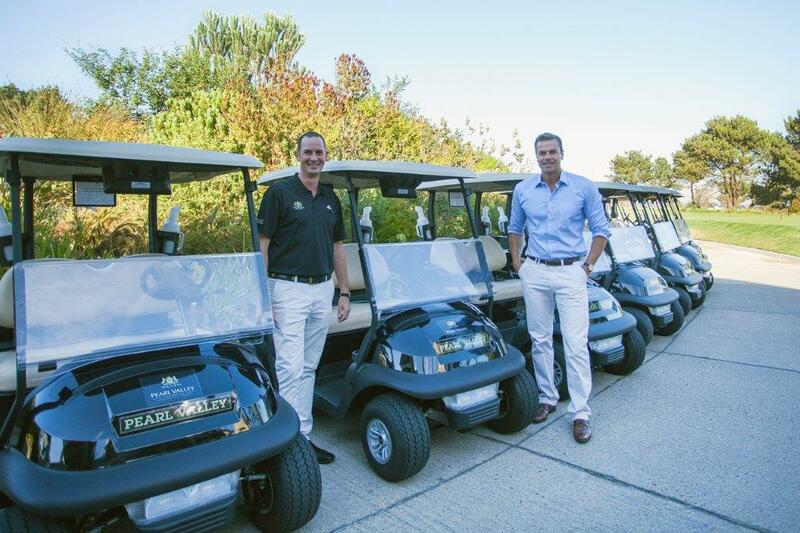 “Now they have excellent carts in which to move around the estate and, of course, these spanking new Club Cars for the course,” concluded Wrigley. Excel electric drive system features hill descent assist, regenerative braking, and more, for speed-range programming. Powerful, quiet petrol or 48V battery-powered engine provides better acceleration and hill climbing ability. Thoughtful ergonomics delivering the comfort and features golfers want. 360° bumper protects frame and body from damage. Monsoon Top™ with built-in drain spouts channels water away from golfers, their clubs and the sweater basket. Thoughtfully designed dash and storage make it easy to store and locate personal items. Spacious bag-well with centre divider. This article was featured in the Tee and Sandwedges July 2017.